Design your own tie and have it printed to order and with you in just a few days. Be original and stand out from the crowd by creating custom ties printed with your designs, photos, and text. Design a neck-tie for Dad, for work, your club, or just for fun. Company ties can be printed with your company logo and even a few words for a motto. You can print the entire length of the tie and both sides. Your personalised tie is made with a stunning smooth satin fabric, in your choice of two styles: skinny or wide. Design your own tie online and add some personality to a classic accessory. Choose from limitless background colours, endless choice of words, your own photos, or a combination with images, graphics, and text. Bear in mind the long thin shape when you design your tie. This specific shape makes custom ties ideal for photos collages and works well for vertical subjects including people standing and monuments. You can try out different looks for your unique tie design, including the free collage maker in our design system, and preview your creations before purchasing. Good quality product. Very happy with how it turned out! The product was very good, the service was great and it was an easy process to do. Thank you. Everyone loves the tie. I bought a standard width tie for a friend. Despatched the next day... and I was so thrilled that I couldn’t keep it til Christmas! Thank you - first class. The tie was perfect and quality was amazing. Shipping was very fast and I would definitely order something again from your website! As well as giving you complete control over the design of your custom tie, we also give you a choice of styles. Choose from a super trendy skinny tie or a classic wide tie. Both styles reflect the same level of superb craftsmanship, with your photos or designs printed to the highest quality. Once you complete your design, within 30 minutes, our print technicians begin working on your tie. Using eco-friendly inks and the most up to date print technology, your designs are bonded to the fibres of the satin fabric in a process called dye-sublimation. This uses high heat and pressure to ensure an even and permanent print which will not rub off or fade over time. Care: The tie is made from a high quality smooth satin with a slight sheen, permanent print both sides. Keep flat. Dry clean only. Do not put in the washing machine. Iron safe. There is no minimum order for personalised neck ties. You can order one at a time or a create a whole range. Whether you want to print your child's drawing onto a single tie as a super cute Father's Day gift, or design custom ties for a mall the staff at a company-wide event, our service will guide you all the way. You can make Australia flag customised ties or witty slogan ties, keep calm or just personal photo ties.Just create a tie design in our preview and you will see them in a matter of days with our fast delivery service. This makes personalised ties ideal as last minute gifts and late party outfit prep. If you need an original idea for a friend's wedding, then custom wedding ties can add an unusual but classy flare. With you in the desginer seat, you can tailor you personalised tie to the precise colour theme and style the wedding will be. 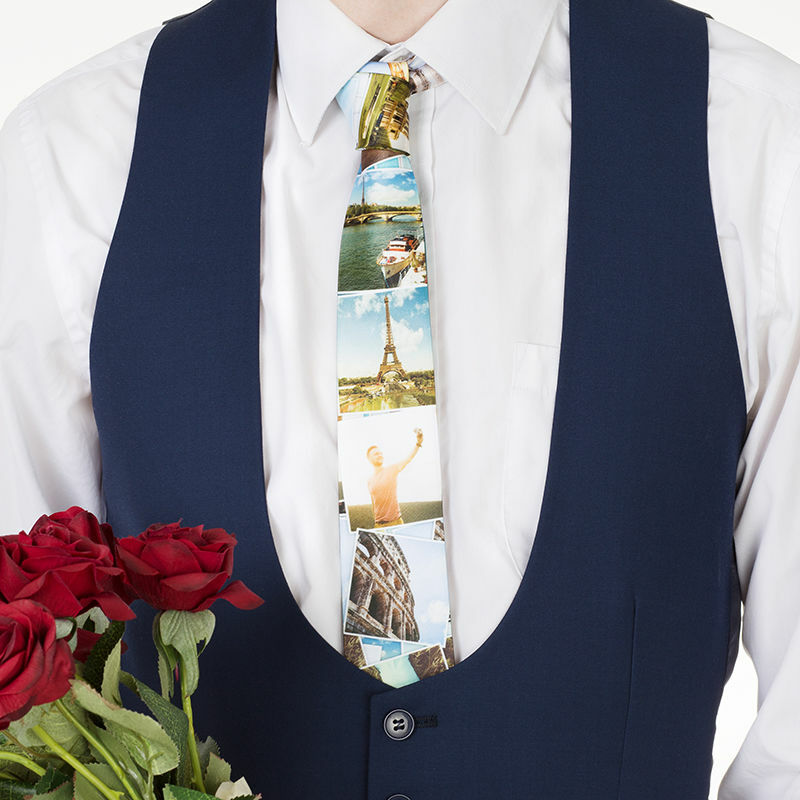 Alternatively, you can print photos from the wedding onto a tie to create a truly unique, post-wedding gift that no other new groom will have. The great thing about this tie printing service is they can be used for all sorts of things. So if you need a bespoke club tie, or event ties for a on-off function, then our on-demand service is perfect for you. You can design a range of club ties for your team featuring the club logo, and have each tie printed with each member's initials, so their tie really is a personalised accessory. With no minimum order, promotional ties can be the perfect accessory to get your brand or your product noticed, and truly make a statement that people haven't seen before.